Keep your restaurant's food cold until your customers need it with the Carlisle Coldmaster food pan. Built from ABS plastic, this 6 in. 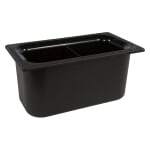 deep food pan is filled with refrigerant gel to keep cold food for hours on end. Featuring 1/3 size dimensions, this black NSF food pan is ready to assist you in your food-cooling needs.